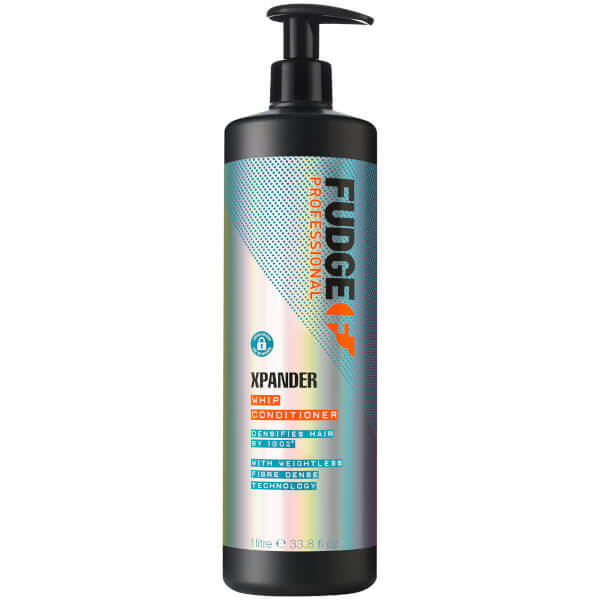 Add body and bounce to flat hair with Fudge Xpander Conditioner; a volumising formula that delivers ultimate texture and definition with long-lasting results. Fortified with innovative Opti-PLEX™ and Fibre Dense technologies, the amplifying conditioner lifts and hydrates fine hair to promote big, luscious locks with enhanced shine and a thicker feel. Delivers weightless volume and energises limp, lifeless hair. Aqua (Water), Cetearyl Alcohol, Behentrimonium Chloride, Dipropylene Glycol, Glycerin, Cetrimonium Chloride, Parfum (Fragrance), Phenoxyethanol, Amodimethicone, Silicone Quaternium-22, Laurdimonium Hydroxypropyl Hydrolyzed Keratin, Sodium Benzoate, Disodium EDTA, Citric Acid, Pentylene Glycol, Polyglyceryl-3 Caprate, Ethyltrimonium Chloride Methacrylate/Hydrolyzed Wheat Protein Copolymer, Hexyl Cinnamal, Cocamidopropyl Betaine, Limonene, Hydrolyzed Vegetable Protein PG-Propyl Silanetriol, Palmitamidopropyltrimonium Chloride, Propylene Glycol, Alpha-Isomethyl Ionone, Coumarin, Linalool, Potassium Sorbate, Sodium Hydroxide.